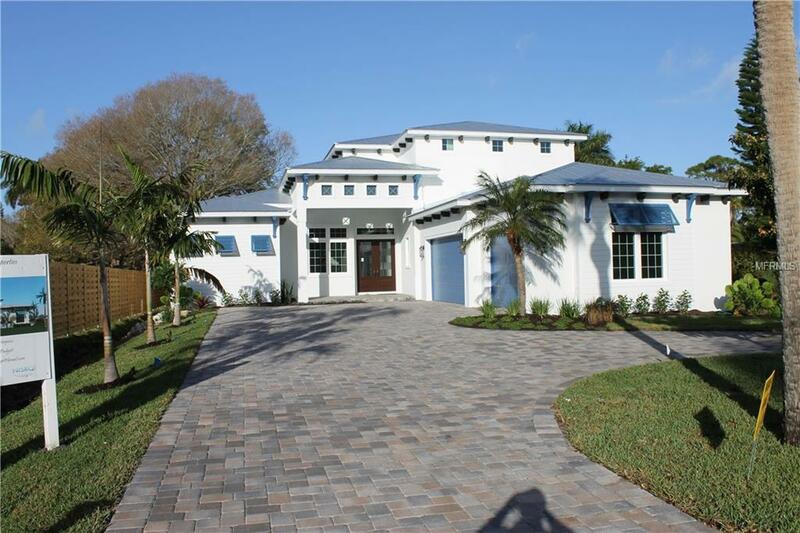 Under Construction but NOW COMPLETE, AVAILABLE AND OPEN FOR SHOWINGS - Incredible 4 bedroom 4.5 bath home in the heart of Sarasota and within biking distance to Siesta Village or Southside Village! When you think "WOW", you will be thinking about this home. Absolutely everything you could desire for your new home in beautiful Sarasota....... FEATURES - 11-4" Ceilings, gorgeous Architectural details, 7.5" wide Hand Scraped Wood Floors, Quartz counters, high end Moen faucets, Brinks hardware and Stainless Steel "Smart Home" Appliances. SAFETY - Energy Efficient Hurricane windows and 10' tall Sliding Glass doors, Concrete Block construction on the main floor, Metal roofing and "ZIP" system water proof exterior sub structure. ENERGY EFFICIENCY - Two - 15 SEER A/C Systems, Low-E Thermal Windows and Doors, Energy Star Rated Appliances, Low VOC paints and Floors and Icynene Foam Insulation over Entire roof structure. Also featuring "Smart Home" Hub allowing for 1-touch controls of lighting, sound, entertainment and environment within your new home! RELAXING ENVIRONMENT - A beautiful salt water pool and spa with water feature and sun shelf nestled up to an beautiful deck and private back yard. The expansive Lanai features Retractable screens and gorgeous outdoor Kitchen. Come visit this home today! May be purchased with a Model Leaseback and/or 1031 Exchange. Buy now even if you are not moving until 2020!